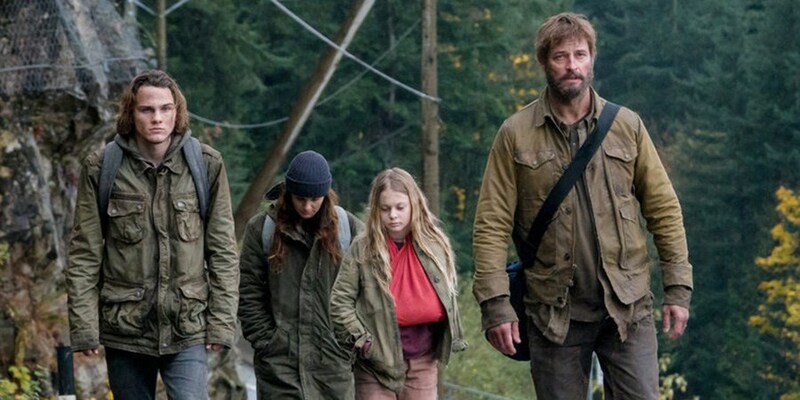 An "USA Original" Series, Colony comes back for its third season as a cable-worthy show it struggled be in its first two seasons, as production moved from California to Vancouver. The story telling from the first episode out has become much more nuanced and serialised. The acting and dialogue are a vast improvement, along with some much better directing and cinematography. It literally feels like a different show. The season is divided in a Story A and Story B structure, kicking off the season by catching up with the Bowmans in the San Bernardo Block, hiding out in a cabin in the woods with new concocted story that includes their dearly beloved "Uncle Alan" in case either the IGA or San Bernardo resistance come a-knocking in effort to protect the Gauntlet, while viewers know Alan Snyder (Peter Jacobson) is still on an IGA leash and could betray the Bowmans at any time. The story moves forward as Katie (Sarah Wayne Callies) and Will (Josh Holloway) discover a new kind of alien ship crash down to Earth, causing IGA troops to descend on the area, once again disrupting the Bowman's life, prompting Will to take Katie's and Bram's (Alex Neustaedter) earlier suggestion to reach out to the resistance and barter with Gauntlet. The remainder of Story A brings the Bowmans and Snyder into the political turmoil of resistance leader Andrew MacGregor (Graham McTavish). As turns out Macgregor has a Host, or a Click, as this block likes to call them, and they finally use the Gauntlet so it can speak, but what the alien tells Will (Josh Holloway), Katie, Andrew, and the camp's mediator, Vincent (Waleed Zautier), is that they really are not the enemy of the human race, but rather they were being chased across space by another alien race and they were using Earth and inhabitants as slave labourer's so it could build a defence grid by the time the other aliens arrived! But MacGregor, having a dark history with the former US Government, decides that the Click is lying and that Katie and Will are double agents working for the Occupation. He is now willing to send the Click on a train to another block with explosives! Vincent not knowing what to believe, outside of knowing that MacGregor is hothead, goes back and forth trying to access the Bowman's, whom have lied about their back story by trying to hide the fact that Will was once an FBI agent and made a deal to work with the Occupation in exchange for finding his lost son, Charlie (Jacob Buster). 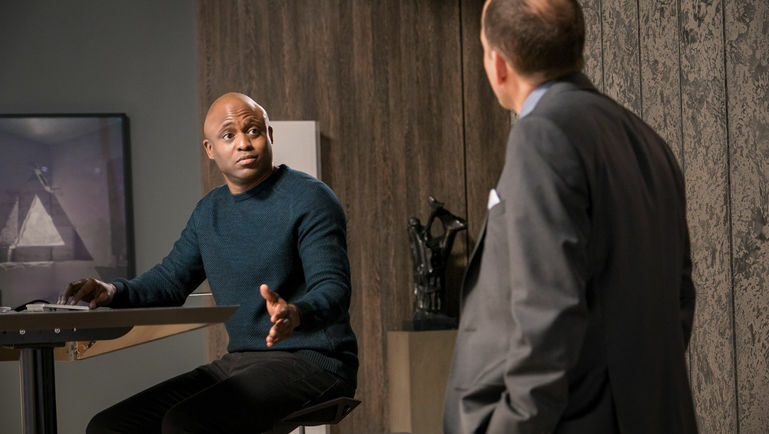 Episode 4.05 is then one of the most politically complicated and emotionally-charged episodes in Colony's history, proving to the audience it can be a dead serious show with real-world truths and consequences. As mentioned, MacGregor's decision to destroy the Click puts the more level-headed and nurturing Vincent in a bind, as he, being overshadowed by MacGregor, interrogates Will, Katie, and Charlie & Grace, while Bram as usual takes things into his own hands, as he hides materials needed to detonate the bomb. Things fall apart fast when Gracie (Isabella Cramp) admits Charlie had "come back" from somewhere, which she claims is just the Greenzone. Will tries to make up for this difference, also acknowledging Charlie's disappearance, except he tells them the truth about where Charlie actually was, including Will's and Charlie's journey climbing over the wall and odd drone experience they had, but MacGregor, being much too smart for his own good, puts together that Will must of worked with Occupation for any of this make sense. Then going back one more time to interrogate Katie, Katie admits to everything, in which she, Will, and eventually Bram are sentenced to death. But there is Snyder. In previous episodes the viewers are reminded that former Proxy Governor is still working for the Occupation, as he made contact when the drones and occupation came to cabin perimeter after the other alien ship crashed. He had dropped a transceiver in the woods after reuniting with the Bowmans and being taken to Macgregor's camp. 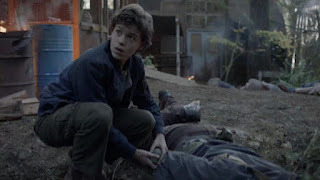 At the end of episode 3.04 Snyder gets wind that they're probably not going to make it out of this camp alive, let alone MacGregor's plan to kill more people and potentially aggravate the aliens further by killing the Click, and so he makes run to try and find the transceiver, only to be caught. In 3.05 he too is then interrogated by Vincent, only for him to instead manipulate Vincent into using the radio to make contact with the Occupation under the false pretence that there would be a safe process, as long as Vincent kept the channel open for no more than 6 seconds. It was lie --And Vincent pays a somewhat undeserved price when MacGregor confronts him and shoots him dead. At the moment the Bowmans are about to be murdered, a sonic weapon is used to disorient everyone at the camp. The scenes are chaos as Occupation soldiers raid the camp and take out everyone in their line of sight, despite MacGregor's group trying to fight back. 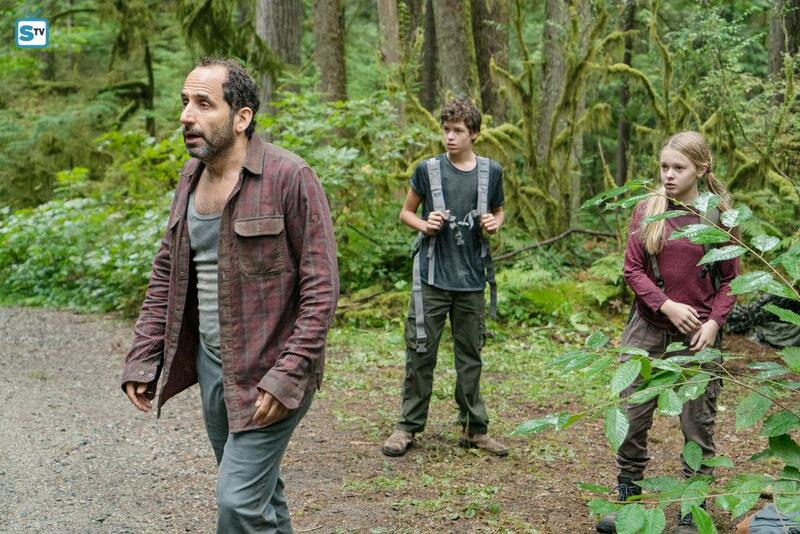 Charlie and Gracie try to make a run for it in the woods, but Gracie falls and injures her harm. Charlie is able to motivate her to move, as the two head for the woods trying to dodge bullets in the crossfire. Will and Katie deduce that the two may have gone to the woods and go there to wait for them. Katie sees Gracie and goes to her, as Will does his best to cover them in all the crossfire, but Charlie, hearing Will, and trying to make his way towards them is shot. The firing from the Occupation and the camp is so vigorous, that they have to leave his body behind. If that wasn't enough to make viewers emotionally break, but still hope that maybe Charlie wasn't dead, they would have a hard time taking in the final scene, when Snyder comes out and is about ready to leave for Switzerland, before he is asked to identify the body of the resistance leader. Snyder walks through the camp stacked full of bodies. He finds MacGregor and points him out and then walks by a tarp covering some more bodies. He sees a familiar hoodie on an arm of the child sticking out. He kneels down to peel the tarp back and it is no other than the body of the now deceased Charlie Bowman. Snyder still manages to collect himself and walk away, as the soldiers also carry the Click to their military vehicles. The next few episodes carry on in the wake of this tragedy with the weight being put on Will more than everyone else, since it was he who went through so much to get his son back, only to be taken away again, and interestingly twice now where the drones let him escape being an Outlier, but for what purpose? Colony then transitions seamlessly into its Story B taking place in the Seattle Block with episode seven aptly titled, Emerald City where the Bowman's are on the road making their way to Seattle trying to save an injured and potentially dying Gracie, unknowingly coming into the purview of an Outlier conspiracy, as Seattle is not run by IGA officials, but rather a mysterious smooth & calm algorithm specialist named Everett Keynes (Wayne Brady). As for Broussard (Tory Kittles) his story is strung along after he meets a doctor named Amy Leonard (Peyton List) when he agrees to help her get a young boy out of the LA Block following it's rendition. The two end up leaving the block too, allowing them bond as they travel across other blocks, meeting other resistance members, and nearly dying from land drones in a pharmacy run shootout, coming across an alien facility tucked away in the woods, but ultimately finding themselves in Seattle and reaching out to Will for a mission that involves stealing more alien technology! After the Bowmans are processed thinking they have disguised their new identities, they are processed into the Seattle Block where Katie finds solace working alongside Michelle (Nicki Micheaux) helping refugees find their place, but Will, becoming a taxi service driver, takes on a plea from a women in search of her long lost husband that proves to Will Seattle is not the paradise it seems and finds himself on a mission to help Broussard and Amy steal something important. 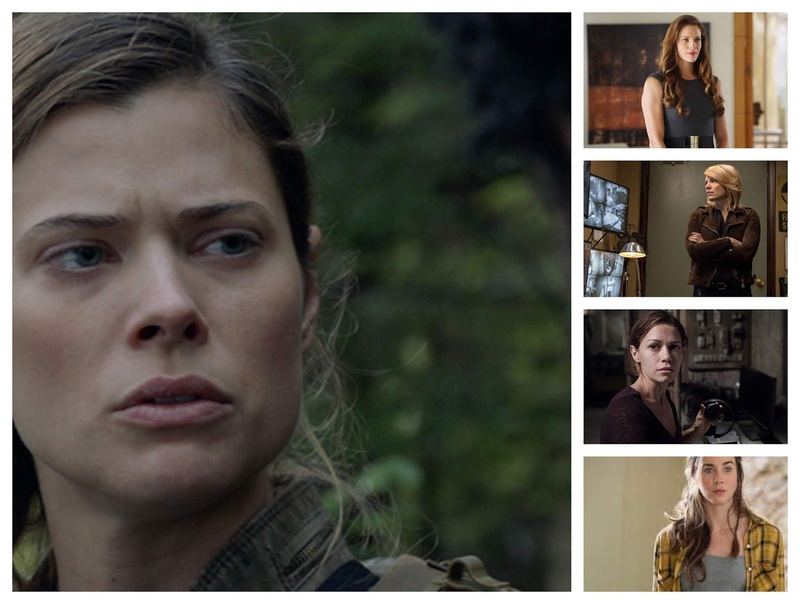 But Snyder has once again been coaxed by his IGA boss Helena Goldwyn (Amy Walker) to step away from a cushy life in Switzerland and investigate the Seattle Block; if viewers thought for a second that seeing Snyder again wouldn't be a problem for Will, they might want to think the better, as the eventual reunion between the men is one of Colony's most brutal interrogation scenes, being on par with something like Fargo or Breaking Bad. Colony's final episodes are then full of a great deal of turn over and plot twists as the writer's play a game of: on again, off again where Bram is mad at his parents and eventually takes the initiative that Katie pushed on him earlier in season, to take care of Gracie. After Will and Broussard steal alien tech that Mr. Kynes later refers to as "ultra lightweight containment", they reach out to a soon-to-be made "real" resistance group lead by someone named, Adam Ford (David Paetkau), all made up of all Outliers to fight in coming war with the other aliens, only to learn soon after that Ford is Kynes partner and Keynes the real leader of the resistance! Snyder still proceeds to take over the block, as Kynes hides out in one of his armory black sites called Bonzo. The resistance have to try and get him out, as Snyder reunited with his new right hand man, Mr. Garland (John Hoogenakker) figure things out pretty fast. From this point on it's become clear Will is now on a suicide mission like never before, as he stays behind during the Bonzo shoot out alone, where he gets shot and eventually later picked up by Snyder's men. Katie wants to continue to fight now knowing what's at stake, but Broussard and Will both push Katie out, leaving her to defend for the kids, only that Bram, not really understanding the full nature of what's actually going on, decides to take Gracie to his girlfriend's father's house and has it out with Katie later. Will comes back to Broussard explaining that Snyder needs 150 Outliers to be on the Island or their hosts won't protect them. They corroborate this information with Kynes, who was badly injured in the Bonzo escape, but begins to recover thanks to Amy's medical skills. Broussard decides to send a signal to other Outliers to come in the Seattle Block to be the second line of defence, while Will goes with 149 other Outliers to the Island, which will take them on the front lines. Before he leaves he meets up with Katie one last time, as she explains she has to find the kids now that Bram has left with Gracie. He tells her has to do this or nothing means anything. They part ways and Katie goes to the refugee camp to use an identity scanner having a picture of Bram's girlfriend. The final scenes begin the alien attack which starts off with a scene with Helena and other IGA officials being killed by new aliens and their cloaking technology! Snyder watches much like Bram and Gracie do from the street seeing Seattle's Block being protected by a defence grid, Will prepares for his pod, and Katie is about to receive blow back from a huge blast, as she gets locked out of the Seattle Block when going back to the refugee camp to use technology to help find Bram and Gracie. 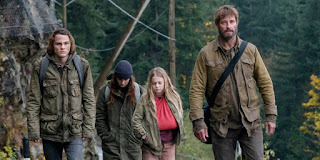 It's sad and hard to recommend a series, knowing that it's unlikely that there will be anymore, since Colony was cancelled one week before it's season three finale aired or with knowing it's first two seasons struggled to become a show really worth seeing, but I find myself being compelled to try with such advancements the third season made. One of it's biggest pleasures outside of serialised storytelling was a much a richer tapestry of recurring secondary characters that helped solidify the world and themes of Colony, including the choice of weaving certain characters (Keynes, Macgregor, Vincent, Ford) from back story to front story and visa verse. One of the things that held the other seasons back was a lot of young teen aged to early 20-something characters that the series seemed to blow through and gave the show a layer of tropey teenage angst that made it hard to take it's bigger picture scenario more seriously. The other young women characters then too share much of this burden as Maddie in particular could of been used much more efficiently in the second season and echoed with characters like Jennifer, Morgan, and Frankie all never reaching survival, but that's not say that Colony may not have used that idea to their advantage, as Amy really tends to compile certain aspects or appearances of all those women becoming greater iteration of them. The mythology too was much greater and woven into a story more full of suspense, turnovers, and plot twists where the mythology no longer felt so bread-crumbed or sparse, but rather rewarding viewers with something interesting in nearly every episode, but also retaining something a bit more character driven. LOST fans too will know doubt enjoy this season more being reminded a great deal of LOST season 3 with plots reminiscent of the Hydra Station, The Barracks, or shared references to The Wizard of Oz or with character names like Vincent and Ford, and with a new doctor character, questioning the integrity of Josh Holloway's character or Snyder willing to gamble, similar to Ben doing the same with his adopted daughter Alex. 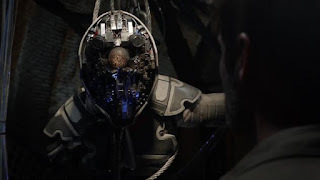 The series also found a way to better maintain it's family drama aspects without feeling so convoluted, which again helped that Bram was written around adult story lines and with more adult characters along with the risk the writers were willing to take with the death of Charlie, allowing the audience to much better feel the Dystopian nature of the series, which really drives Will's story forward for strong finish. 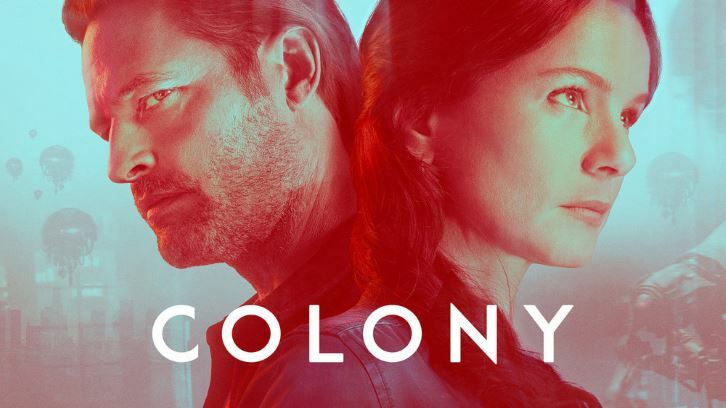 If your a viewer willing to see something evolve into something miraculous, then I still recommend watching Colony sometime when you're looking for a good science-fiction Dystopian alien invasion family drama, but if you can't stomach a cliff hanger with little resolution on what the actual outcome of the series is, then you many feel Colony is a waste of your time.